Fifty pounds. Lose 50 pounds, the doctor told me, and then we can start to talk about taking the kinds of steps that’ll make you happy and healthy for the long term. 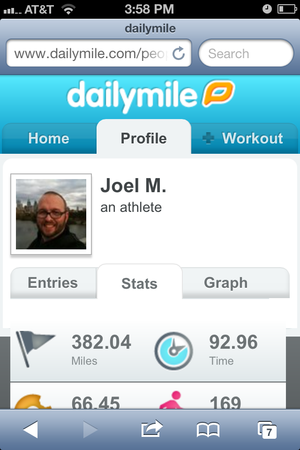 DailyMile is a Web-based app that records your exercise and offers encouragement from friends. Maybe, he added, you should think about bariatric surgery. I thought about it…for about five seconds. Then I rejected the idea. After a lifetime of poor and inconsistent eating and exercise habits, I’d arrived at age 40 desperately out of shape—a weight that measured (ahem) somewhere in the upper 200s—with some preliminary warning signs that the remainder of my life might be a) unpleasant and b) not all that lengthy if I didn’t turn things around. No shortcuts out of that, I decided. It was time to revamp my entire lifestyle. Two months later, it looks like I’ve made a good start. I’m exercising more and eating better—and more consistently—than I have in years. And no surprise, my iPhone and iPad have accompanied me closely every step of the way. I’m told that once upon a time people lost weight without the use of iOS devices, but for the life of me I don’t know how. For me, technology has been a crucial aid. The first step for me was to stop, think, and start to read about which approach might serve me best. There are a million weight-loss plans in the Naked City, and my friends recommended any number to me. Using the Kindle app on my iPad mini, I perused several of the books before settling on a recent entry, VB6: Eat Vegan Before 6:00 to Lose Weight and Restore Your Health…for Good, by New York Times food writer Mark Bittman. His recommendations were similar in their basic outlook to other books I checked out—shifting one’s emphasis away from eating meat and processed foods in favor of a daily regimen consisting mostly of vegetables and whole grains. Lose It gives you a calorie budget and lets you track your intake. Crucially, doing my research using the Kindle app saved me lots of money. That made it easier to peruse several options, instead of throwing a dart at the first diet plan that caught my eye. Bittman’s book carries a list price of $26; I was able to buy it for half that amount as an ebook from Amazon. Bittman’s plan doesn’t require strict tracking of your food intake, but I started keeping a food diary to try to be thoughtful about what I was eating and when. When that turned out to be cumbersome, I turned instead to the Lose It app for iPhone from FitNow. I’d actually tried this app once before and had given up quickly—that was before I started reading and deciding how I wanted to eat—because Lose It works a lot like Weight Watchers: It gives you a daily calorie budget, according to your weight-loss goals. If you start counting calories without changing how you eat, you’ll hit that limit pretty quickly, and I often did. After reading Bittman, though, Lose It started to help me see that a plant-based diet helped me eat plenty during the day—enough not to be hungry—while leaving me lots of room under the calorie cap. My earlier, cheesesteak-based diet had done me no such favors. Tracking calories can be a bit of a drag, but Lose It makes it relatively easy, with calorie counts for thousands of food items—including menu items at hundreds of restaurants—and you can add many food items by using your phone to scan in the barcodes on their packaging. It’s a little trickier if you’re actually cooking foods from scratch, but even that’s pretty easy to do. 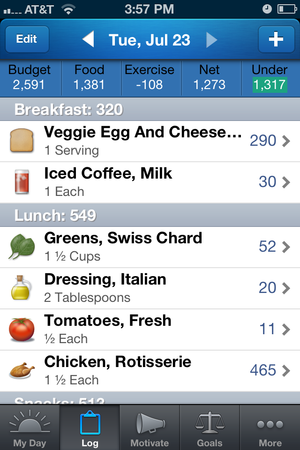 MyFitnessPal.com, which has a host of iOS apps associated with it, can do the calculations for you. And the best recipes? You can store those directly to the Pepperplate app, a sort of Instapaper for foodies. 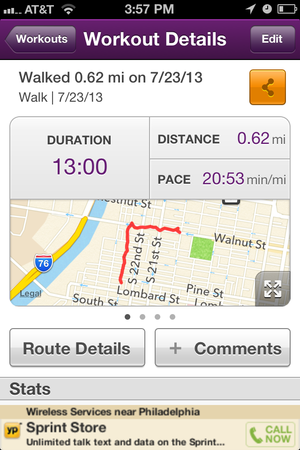 Map My Walk works as a GPS-enabled pedometer, tracking your distance and speed. Tracking my intake wasn’t enough. I once got into the best shape of my life through relentless exercise—but without changing anything about my eating regimen. My metabolism has, in early middle age, slowed enough that I probably can’t repeat that feat, but activity is an important component of a healthy lifestyle change regardless. I’ve ended up using two apps to track my physical activity. For all my visits to the gym, I use DailyMile.com, a Web-based app that, in its mobile version, has the look and feel of a native iOS app. I’ve saved it to my iPhone’s home screen and log in my exercise right after I finish. But I also live in one of the most walkable cities in the United States—Philadelphia—and I quickly realized I should be skipping the bus and spending more time on foot. Several friends recommended that I buy a Fitbit tracker to use in conjunction with its iOS app so that I could automatically track every step I take. I skipped that in favor of using the free version of Map My Walk, a GPS-enabled app that maps your route and calculates your average speed on it. I turn it on every time I leave the house for a short stroll. And I’ve learned one great thing from it: I’m a speedier walker than I thought I was. Because it’s 2013, all of these apps have a social media component. Lose It is a self-contained universe—you can add friends who are also using the app. (I have periodically exported a spreadsheet of my progress, and post it to a blog for people to see.) My craving for social feedback helped lead me to DailyMile and Map My Walk, both of which have their own networks, but also let you share information to Facebook and Twitter. That, in turn, has helped me create a larger community of people encouraging me and occasionally challenging me to do better. All of which helps. After two months, I’ve lost 10 pounds—short of my 50-pound goal, yes, but I’m just getting started: For the first time in my life, I feel like I have the power to control myself and to form good habits. My iPhone and iPad have been indispensable tools in the process. And I only have 40 pounds to go.